Aren't they beautiful? 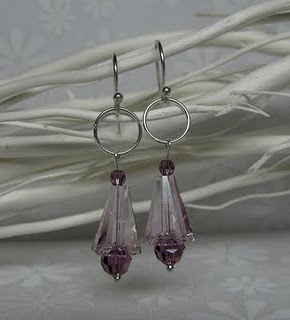 They are Geometric Amethyst Swarovski Sterling Silver Earrings. A quick write up from the blog I won them on "This is a pair of unique geometric earrings which were designed using a combination of different shapes and colours. The focal area of these earrings is the light amethyst artemis Swarovski crystal bead in a cone shape with faceting along its length. Nestled into the beveled bottom end of the artemis bead is a dark amethyst faceted round Swarovski crystal and a similar but smaller dark amethyst crystal sits on top to add interest and a pop of colour. These earrings dangle beneath a sterling silver ring which is attached to hook style earrings. They measure 40mm in length and come with PVC clutch backings for added security. (ARV $24)"
Denise is the owner over at BeadedEmbellishments, an Etsy shop full of beautiful beaded jewelry. I want to also mention that Denise is from Ontario Canada! Denise has been making jewelry for more than 10 years. She started making for herself, friends and family and then decided to open her own Etsy shop. Denise only uses 925 Sterling Silver in her designs and not silver plated or base metals as these do not hold up well over time. Also she uses Swarovski Crystals as opposed to Czech glass beads because of their outstanding quality and brilliance and also because of their reputation of excellence. I love my new earrings! I have had many nice comments while wearing these. The quality is great and the customer service is wonderful. They were shipped fast and packaged beautifully. I normally do not wear dangle type earrings as I work in a health care field and also have smaller children so I am not sure to them being a bit heavier than stud earrings. I did get used to that after a couple wears. Denise sells her jewelry fairly priced for the quality of Canadian handmade products you receive. Her earrings range from $22-$42 and shipping is $2.99 for the first item. Would you like to win your very own BeadedEmbellishments earrings? Denise has a summertime giveaway going on now until June 28th, with a name being drawn on the 29th! Denise is giving all Canadian Coupon Mom readers a 10% coupon code good until June 28th on any Earrings. Just enter the CaCoMo at the appropriate place in the checkout process.